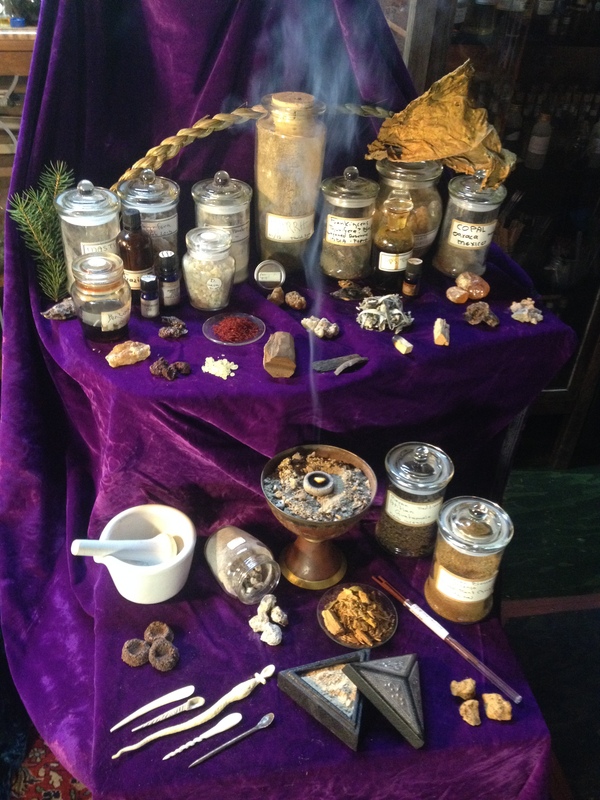 How do I burn Frankincense, Myrrh and other oleoresins as incense? Raw oleoresins, are usually the exudates formed on the surface of trees and plants, which we have collected and used as medicine, perfume, incense, adhesives and for many other applications, since time immemorial, across the globe, and in most every human culture. Though we like to cal them saps, they differ from the true sap of the tree since they are usually produced by special ducts close to the surface of the tree in response to injury. Saps are usually considered the liquid that the tree produces deeper in itself which carries nutrients between roots and the farthest reaches of the tree. Usually accessed by deep tapping of the tree. Our fragrant oleoresins are sometimes exuded naturally, or more often than not in response to our intentional damaging of the bark to produce a resinous response from the tree to the wounding. Usually this method of encouraging the tree to produce oleoresins does little harm. As incense, these oleoresins are burned, alone or in combination with other fragrant natural materials such as powdered barks, flowers and essential oils. In ancient times, hot embers from the fire were used to burn incense resins. Today most cultures around the world use manufactured charcoal pucks, made from compressed powdered, partly burnt wood. Often these are impregnated with Saltpeter so they burn evenly. In countries where burning oleoresins is a daily tradition, one will find simple and ornate electric burners in most homes. A small selection of natural fragrant materials commonly used for medicine, perfume and incense, and a few traditional incense products. Note the charcoal puck in the raised brass censer. Churches and temples of most religions, practice some form of ceremonial burning of incense, whether as an offering to the god or gods, to purify the area, or to create a receptive atmosphere for supplicants. Studies have shown that oleoresins such as Frankincense Papyrifera contain psychoactive ingredients that affect our brain chemistry through their smoke. Incense is burned in many countries on a daily basis before meditating, after cooking, to purify and cleanse the home physically and energetically, for magic, ritual, and for healing. It has been shown that our bodies can absorb the medicinal, healing properties of oleoresins such as Frankincense through the smoke released while burning. For instance, Incensole and Incensole acetate are two such chemical compounds found in Frankincense Papyrifera that can induce feelings of heightened spirituality and well-being , reduce feelings of depression and anxiety, and in studies have been shown to reduce inflammations in the brain, http://www.ncbi.nlm.nih.gov/pubmed/19814859?dopt=Abstract. Each country, culture, and often different provinces or villages have their unique recipes for the traditional incense type associated with their culture. 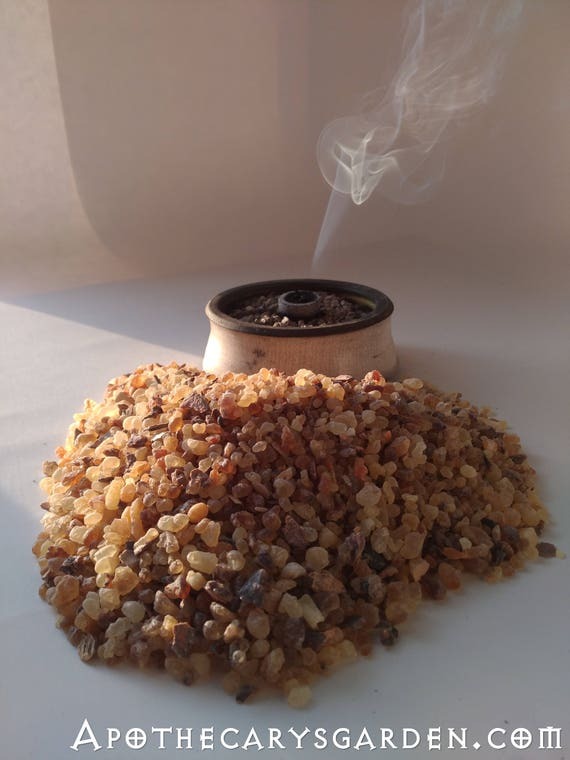 Raw resin incense is burned by placing small, pea sized pieces, or a small scoop of powdered resins, see post ( How to grind Frankincense and Myrrh), on a smoldering charcoal puck. The heated oleoresin melts and burns, releasing its essential oils first, (the oleo part), then the resins which require a higher temperature follow suit, producing aromatic smoke with a fragrance unique to each specific oleoresin. Today, in most North American cities, we can find these foil wrapped charcoal pucks in corner stores, head shops, Asian and Mediterranean food stores. Often wherever Hookahs and Nargillas are sold. A pack of charcoal pucks ranges in price from $1.00 to $5.00 depending on where they are sold. A wide variety of odoriferous natural materials such as tree and plant oleoresins, powdered fragrant woods and barks, flowers and essential oils are common ingredients in traditional and modern incense products. Many types of incense are available commercially, pre-mixed and pre-formed as cones, discs, sticks, ropes, papers and powders. Often their base material is finely ground Sandalwood powder, some types use natural gums as an adhesive to hold their shape, and some contain saltpeter to keep them burning consistently. NagChampa is an example of a compound incense recipe, familiar to many of us in our western culture. Unfortunately, to increase profit margins, artificial fragrances are often used as inexpensive replacements for essential oils, and artificial colours are sometimes used to make the products more visually appealing. I suspect the cheaper, “dollar store” varieties of cone and stick incense fall into this category. Knowing this, makes the option of using whole oleoresins and natural fragrant materials even more appealing. 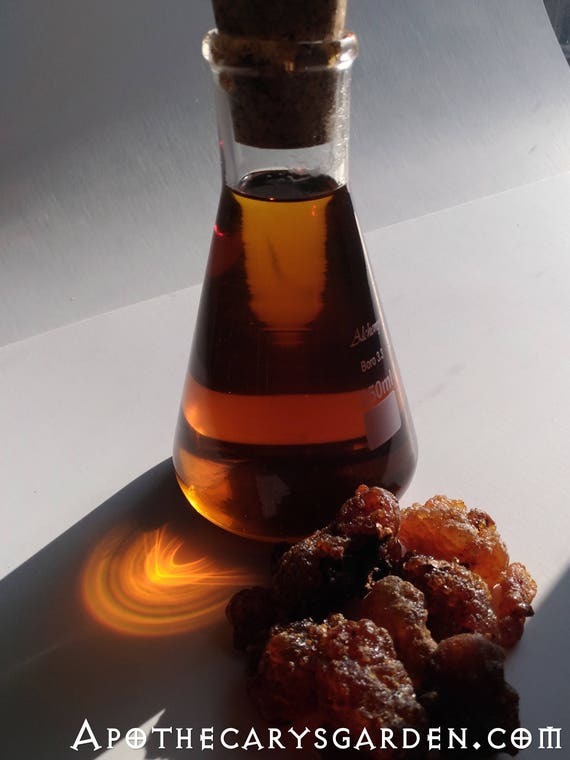 One can simply burn small amounts of a single oleoresin, such as Frankincense, Myrrh or Mastic, or one can create a unique incense product by powdering and blending ingredients. It is an easy, and very gratifying process that requires no great skill, financial outlay or expensive tools. A simple way to experiment with incense making, and enhance your enjoyment of resin incense, is by adding a drop or two of your favourite essential oils to the resin, while or before burning. For easy instructions on making your own incense from Frankincense, Myrrh, Pine or Spruce and many other fragrant oleoresins, please see my post-Instructions for making Natural Incense-Powders, Pastilles and Cones. After you have some charcoal, you will need something to burn your incense in. A censer. Censers can be purchased made from different materials and in many styles. They can be found in brass, silver, steel or ceramic, from the simplest of designs to the most elaborate and bejewelled, open to the air, or with ventilated lids. Practically any non-flammable container, dish or bowl found in the average home can be used as a censer. A fully functional censer can be as simple as a glass or ceramic plate or bowl layered with kitty litter, fine gravel or sand. This non-flammable, insulating layer keeps the hot coal from coming close to, or in contact with the censer. Otherwise, it could heat up and burn fingers, whatever it is sitting on, and if the censer is glass or ceramic, it could crack or break from the direct heat of the hot coal. Many household items can be used as censers This is a collection of possible candidates for censership, found at a glance in my study. 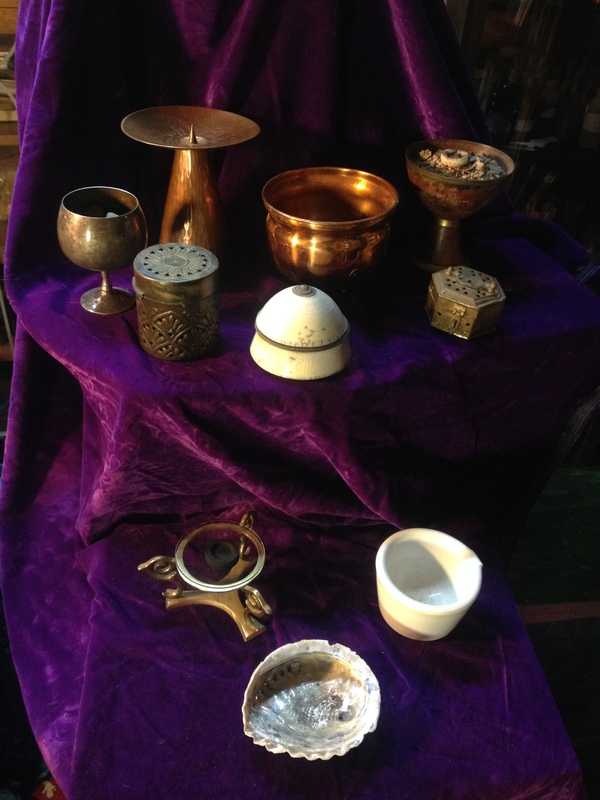 From the top Candleholder, Silver chalice, various metal bowls, closed and ventilated brass boxes, a ceramic container which can be used with the lid removed, (putting the lid on is a way to extinguish the charcoal.). On the bottom level-A brass stand with a `watch glass`made from `Pyrex`, (Note, it must be made from borosilicate ie., stamped with the trade name Pyrex or Kimax etc.glass which will not crack or shatter with a drastic change in temperature! ), a porcelain mortar and a seashell which is a traditional native censer for aboriginal smudge mixes. Light an edge of the puck with a lighter. (Hold it on the opposite side!). When it starts to sparkle a bit, or make a slight crackling, hissing sound, then the Saltpeter has been activated and the coal is igniting. Place your coal on the sand or litter and give it at least one minute to sit. Pass your hand over it, if you feel it is emitting heat then all is good. I usually wait till I can see a fine layer of white ash covering the puck, which tells me it is well-lit and the melting resins will not smother it and put it out. Take a small piece of frankincense or other resin, ( the size of small pea or a lentil), and place it in the middle of the coal. It will shortly release its fragrance and smoke, and there you have it. Pure, natural incense. Never leave lit charcoal unattended, or close to flammable materials. Reading this post a year later, I must add that there are alternatives to the Saltpeter infused “quick starting” charcoal discs. There are a number of charcoal products available that do not spew out acrid Potassium Nitrate or Saltpeter smoke, which is a disagreeable odor and detracts from the experience for many of us. One can also use cubes of compressed charcoal made from coconut shells, and the Japanese have a couple of alternatives, one is a type that is coated in a silver foil and considered good quality for a reasonable price. The only drawback to these more natural charcoal alternatives is that they are understandably more difficult to light. One must use either a torch of some kind and bring the flame to bear on them for at least a minute, or place them on the red-hot electric element of a stove till they are sufficiently ignited to continue on their own. They can be found at some Mediterranean groceries and specialty shops. Another method which is halfway to an electric incense burner, is the use of a piece of tin foil, aluminum foil, or thin metal baking tin and the electric element on your stove. One can place an appropriate, small, thin, heat conductive and inflammable metal sheet on the element, turn it to medium high, place a piece or some powdered incense on it, and wait for it to smolder. The heat can be adjusted as needed on the stovetop, keeping in mind that aluminum foil will melt if the heat is too high. Remember this will become VERY hot, so plan ahead exactly how you will maneuver it on the stove. Thin pieces of Mica can also serve the same purpose and can be easily cleaned with alcohol and reused indefinitely. Though using the aforementioned charcoal pucks to burn our incense is the most common method one sees nowadays to enjoy raw incense resins and natural incense blends, it does have some obvious drawbacks. The Saltpeter that makes them easy to light creates a thick and very unpleasant acrid smoke which is counter productive to the purpose of enjoying and benefitting from the fragrance of our incense. Lighting the puck outdoors and waiting for the smoke to dissipate is one way to work around this problem. The charcoal pucks burn at a steady high temperature, much hotter than one needs for burning of the resin portion and the essential oil portion of our oleoresins. The temperature of the charcoals also burns the gum portion of Frankincense, Myrrh and other oleoresins which simply smells charred. 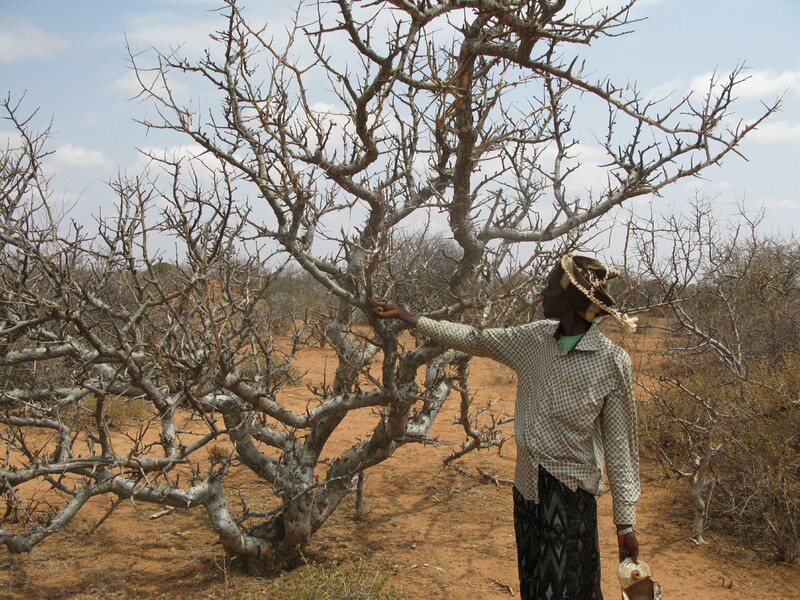 To be precise with words, Most all Frankincense types and Myrrh types are in reality Oleo-Gum-Resins. They all contain between 20% and 60% water soluble gum which does not melt, has no fragrance on its own, and does not smell very nice when it is burned. 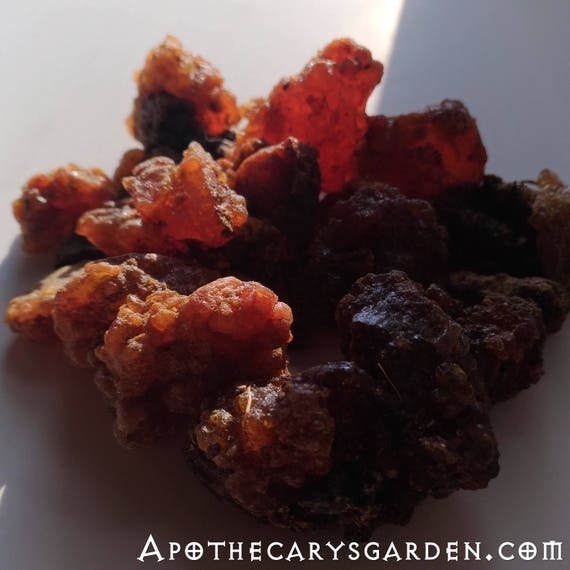 When we heat Frankincense or Myrrh the volitile, or essential oils are first to evaporate and reach our noses, next, the resins reach a temperature where they combust with the heat and generate fragrant smoke. However, once the resin portion has burned, the water soluble gums follow suit. These gums simply create a charred or burnt smell which in general is unpleasant. Usually, this is not too obvious and there is enough fragrant smoke to mask the smell of the burning gums. Many precious exotic and fragrant woods like Oud, or Agarwood, and Sandalwood, provide us their fragrant essential oils and resins in a matrix of their wood. Again, a charcoal puck burns at a temperature that combusts the wood along with the delicate essential oils and resins. The solutions to all the above issues with using charcoal are elegantly resolved by using an electric incense burner. A heater really. An electric burner allows us to regulate the burning temperature according to the material we are using and to make the most of each fragrant material. An electric incense burner also allows us to greatly extend the time each incense give us for its enjoyment, sometimes by hours. We can enjoy a completely smoke-free experience if we so choose by keeping the temperature low enough to only release the fragrant molecules into the atmosphere with no actual combustion. An electric burner also allows us to use only some of the incense and save the rest for later. All in all, it offers us much more control and room for enjoying the experience than charcoal pucks. In North America Mermade Magickal Arts supplies a well made, reasonably priced, and beautiful looking electric burner of their own design. While you are there check out some of Katlyn Breene’s exceptional incense creations. If you live in North America, it is likely there are natural fragrant materials perfectly suited for use as incense found in nature all around you. Pine, Spruce and Fir trees all have wonderfully fragrant oleoresins, or saps, and needles. Cedar leaves, White sage, and tobacco are ingredients in Native American Smudge, or incense mixes. Always be respectful of plants if you do harvest some for your own use. If you like, have a look at some of my posts tagged “Wildcrafting” for some thoughts around how to nurture a mutually respectful relationship with Nature and the plant kingdom. This is very important!! I can’t stress this point enough here. Collect some Pine, Fir or Spruce sap, without damaging the tree, preferably after you have given the tree something, a symbolic gesture is fine, whether a few supportive words, an acknowledgement of your gratitude for their gifts, leave something personal or something that has meaning to you. Sometimes our Pine trees exude their sap due to an injury caused by an insect called a borer. If you come across a single one eighth of an inch hole under the sap you have scraped off, a stiff piece of metal wire poked deep into the hole will put an end to the creature who has damaged your tree, and will make sure it does no further harm. Though one person smushing the occasional grub will have absolutely no effect on the blight of borers decimating our forests, it is a clear and practical act of caring and giving , an act of stewardship. For this reason I always carry a wire with me. We each find our own ways of developing and nurturing our relationships with trees, plants and nature. If there is one single problem with our civilization as a whole, one that underlies many of the diseases and socio-economic problems we face, it is how divorced and separated we have all become from nature, and how poorly we treat it in our rush to capitalize on every resource we can profit from, at any cost. These local oleoresins are lovely burned as incense. For easy cleanup of hands, tools and containers from the sticky oleoresin, use a little olive oil or vegetable oil followed by warm water and soap. The oil and “saps” will leave your hands feeling soft and supple. There are many valuable healing Phytochemicals in these oleoresins whose main function is to protect and heal the “skin” of the tree. It is difficult to find really fresh imported oleoresins such as the different types of Frankincense and Myrrh on the market. Most of the material I have used over the past 40 years has been decades old, passed many hands, warehouses and middlemen. This is simply what has been available to us all here til now, and more the norm than the exception unfortunately. Since many hardened incense resins keep their shape and texture for decades if not hundreds of years, it is difficult to tell if they are fresh or have been warehoused for decades without examining them closely or testing them on the coal or through distillation to measure their essential oil content. Most will show some degree of increased fragrance or softness when cracked open, but not all fresh oleoresins reveal their age in this way. Though most incense resins keep their aromatic and medicinal qualities intact for decades, there is nothing quite as gratifying as working with fresh, fragrant aromatic material. If you would like to learn more about incense in all its facets, make sure to visit olfactoryrescueservice.wordpress.com. They are one of the best blogs on the subject and have an extensive library that covers not only all the different incense materials, their history and methods of use, recipes and instructions, but also current reviews of the best suppliers for the different incense ingredients and products on the market. Run and written by some very knowledgeable people including Ross Urure who I consider one of North Americas premier incense artists. remember, to always take notes! Your future self will thank you!! Have a fragrant holiday season. Is burning frankincense and myrrh safe to use around pets? Hi Melissa Anne. To the best of my knowledge, burning Frankincense and Myrrh around pets is perfectly safe. I have heard no information that indicates otherwise. The main concern around incense and pets, in my opinion, would be to make sure pets and hot incense charcoals are not left unsupervised. Animals can accidently knock over burning incense and this can be dangerous. When my cat got an upper respiratory infection recently, I used frankincense to help him out. In addition to some immune boosters, I fanned the frankincense smoke around him a few times a day for the first three days. He’s 19 years old and got better on the fourth day with no issue since. In general, those types of illness don’t resolve quite so fast if left on their own. I believe it’s usually a week, sometimes 2, and often with medical intervention. I did a bit of research and heard some anecdotes about older civilizations using frankincense to smoke animals who are sick. In my case, it worked great. I’ve also used it myself the same way for when I feel a cold coming on. I was interested in the idea of using foil as a censor on a hot plate. Then you mentioned using mica in this article! Love this idea! I’m wondering if you specifically mean mica glass for wood stoves, or possibly a thin slice of natural mica, etc. The mica glass is much easier to find. What are your thoughts? Do you have a specific place in mind to purchase the mica? Hi. I have purchased squares of what I believe is natural Mica of varying thickness online. I believe they are often used with different types of electric incense heaters. They work well on a hotplate if the temperature is low or they are raised a short distance from the element. See if you can find them online, on EBay perhaps. If you can’t locate them let me know and I will ask around. i have an electric burner with a removable glass dish on top where I normally pour aromatherapy oil into. If I’m using it to burn frankincense resins, must I pour in a little water into the dish together with the frankincense resins? If your diffuser/burner heats up to a high enough temperature to burn incense or release it’s fragrance, I would simply use a piece of tinfoil to line it and place your frankincense in the foil making sure the foil is in good contact with the heater. It is much easier to clean this way and will heat up above 100 degrees centigrade. Water will keep the temperature below 100 degrees and may not be hot enough to get good results from your resins. Great information! You might like to make a correction, though– the word is “censer,” not “censor,” which of course is a different matter entirely! Some years ago I tried this with commercial charcoal pucks, and I suspect they contained saltpeter, as you mentioned. I’m glad to understand that this stuff is present, as they had a rather odd smell that didn’t seem like wood and that interfered with the scent of the frankincense. I think I’ll look around for something better now. Thank you Elene!! It’s great to have proofreading apps, but they aren’t perfect! I try to light the coal outside then bring it in once the smoke has subsided. Also, it is possible to light natural charcoal on top of a gas stove, then transfer it to your censer. Lovely smelling post, Dan. I tried some time ago, to burn a little piece of your frankincense on a puck. I waited till the puck was well lit. But for some reason it wouldn’t burn properly – no fragrance. Was there something I was doing wrong? The only thing I can think of Jane, is that your charcoal was lit, but perhaps not yet in “full swing”, and a moderate sized piece of resin simply extinguished it, or there was a piece of gravel or mud mixed into your frankincense, which does not seem likely at all. I would hate to see you give up or feel disappointed my friend. Would you consider giving it another go? Perhaps wait till your charcoal is white with ash, then put a lentil sized piece on it.What do you think? Good luck! I think you will get a lot of pleasure from the resins and essential oils on the coal Jane if you can get them working for you.